As promised, here is the picture again of the Mexican meal I created the other day. 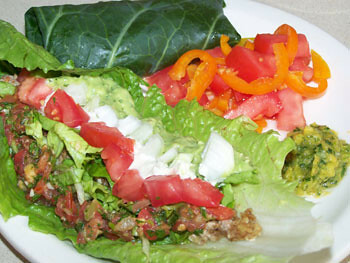 It will be served at the upcoming 3-Day Raw Food Spiritual Ashram Retreat (only a few spaces left!). Since many of our readers can't make it to the retreat, I said I'd post some of the recipes here in the blog. I hope some of you will try to create the recipes and let me know what you think! So, here's how I made the REFRIED BEANS that are stuffed into the collard wrap at the back of the plate. You can't see them, but they look similar to refried beans---and they taste great!! This is a slightly altered version of the "spicy beans" recipe found in Raw Food, Real World by Matthew Kenney and Sarma Melngailis.? Place all ingredients (except for the scallions and cilantro) into a food processor. Process until you have a refried beans consistency. If you need more moisture, add one Tablespoon at a time of the sundried tomatoes soak water. When you achieve the desired consistency, mix in the chopped scallions and cilantro. This recipe stays well in the fridge and tastes fantastic the next day! I stuffed the collard leaf with some of these refried beans, some Mexican "rice", a litle bit of salsa, and some sour cream. It was delicious! You can also add some chopped tomatoes and onions to it, to give some extra crunch and flavor. YUM! Oh my word! I'm hungry. Another great recipe for me to make for the hubs! I like your variation on this. Thank you for being so generous with your recipes....you are a peach!! That just looks so delicious! It was delicious!!! Thanks so much for sharing some with me. Thank you for posting the recipe. I will make is as soon as my juice feast is over! I think I should start a little book of raw recipes to have at the ready. That seriously looks just like real mex food! I bet it tastes great. I'm looking forward to your new recipe to try with my new spring form pan! Thanks for the tip on lining the bottom, too. Mine has a glass bottom, would I still need to line it? Thanks, again, for the comments!